On a rainy Tuesday, Michael B. Jordan looks through the window in a Manhattan hotel and says, "I think everybody's real sad right now." The "Black Panther" star is talking about the passing of Marvel legend Stan Lee, who died on Monday, and the legacy he leaves behind. "The sky's crying a little bit for Stan," he said. "It's been all the things he's contributed to. Marvel changed the face of entertainment in a lot of ways. To be part of 'Black Panther,' one of the last movies he got to see come together, I felt really honored to be part of that." The success of "Black Panther" would not have been possible without Lee, who co-created the comic book character. It's also unlikely the film would have been the smash hit it was without director Ryan Coogler, either. Jordan and Coogler have been working together since "Fruitvale Station," the acclaimed 2013 indie movie about Oscar Grant III, an unarmed black man who was killed by a white police officer in Oakland. Jordan said that Coogler showed him a person of color could succeed behind the camera in Hollywood. "He was my representation," Jordan said. "Being able to work with Ryan from a small independent film all the way to the biggest budget, to a Marvel film, he kind of showed me what was possible." In September, Jordan and WarnerMedia announced that they were launching a company-wide inclusion rider with the film "Just Mercy." Jordan stars in and executive produces the upcoming movie. "Being a person of color, you always try to reverse-engineer or find ways to make things easier to give more opportunities for yourself and other people who look like you," he said. "To be part of 'Black Panther' was just a monumental move, to shift the needle, to get people to look at things a little differently, to bust through these glass ceilings that were in place or the way people used to think about projects like that and also being able to work with the inclusion rider to be able to push that narrative forward." "Just Mercy" is set for release in 2020, but right now, Jordan is busy promoting "Creed II," the sequel to the 2015 hit. He admitted that it was strange not to have Coogler direct. "It was a little weird at first, but he was finishing 'Black Panther' at the time and he couldn't do both," he explained. "It was a really big deal; it was a lot of work for him on 'Black Panther,' and he was still able to produce ["Creed II"] but put it on Steven Caple, who is an amazing young director from Cleveland, Ohio." Jordan said working with Caple was similar to working with Coogler in his early career. "Ryan came out of Sundance, did a small independent film and then he did 'Creed'; Steven Caple did a small independent film and then did 'Creed' so they had a similar trajectory and path, so [the movie] was perfectly spot-on." 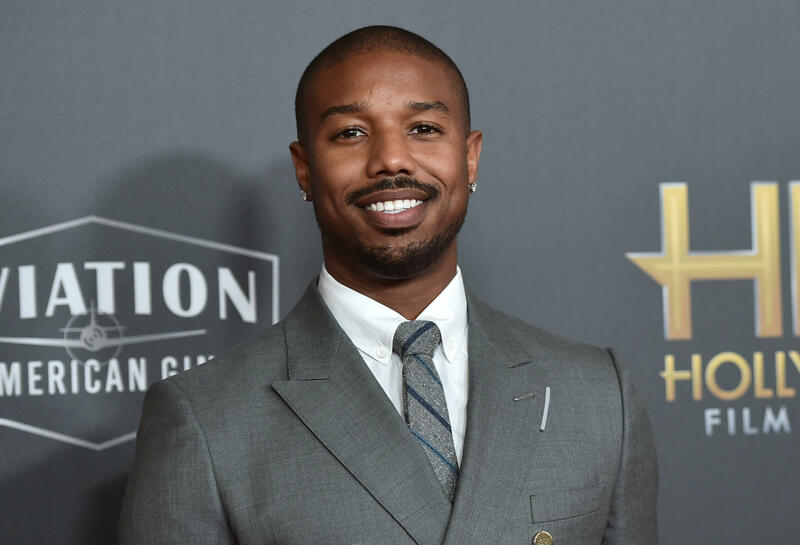 The actor is excited for fans to see a more grown-up Adonis Creed, and the evolution of the relationships from the first film, "especially between Adonis and Bianca, Adonis and Rocky." He continued, "He's becoming a father now. He's creating his own family and I think that's something he's been longing for for a really long time and the revenge element of it all — the fact that Drago is back in town, it makes you feel a little bit like 'Rocky IV' — that closure of 'Rocky IV,' you know — so you get that grudge match feeling. It's action-packed." Jordan said being on set with Sylvester Stallone and Dolph Lundgren made him want to prove himself and get physical. "I'm competitive," he admitted. "You get me and Florian [Munteanu] — we both are very competitive. When you've got Sly and Dolph sitting over there and they're talking about the good ol' days, when they used to get in there and slug it out and get hit. They went through it and we kind of wanted to go through it, too." Jordan said he was careful not to go overboard, but let his hands and knees take a lot of "wear and tear" while filming. "Creed II" drops on November 21, Thanksgiving Eve, but Jordan is also making time during the holiday season to give back. He is teaming up with Honey Nut Cheerios' Good Rewards program to help raise money for Feeding America, a charity that hits close to home. "I've always been around food," he explained. "My dad worked for a food bank; he used to manage one in Newark, New Jersey. I always saw the need to help people; my mom's a social worker. And they're all very good cooks, so food has always been a very big staple in my life." In fact, Jordan said his family had a home catering business, and he grew up cooking. He said he's still trying to figure out what to make for his Thanksgiving brunch this year.